In the 21st century, the internet has provided a more effective and accessible alternative to the traditional mediums of communications that existed before it. Things like wireline technology, television, radio, paper mail, and newspapers, that were once regarded as revolutionary, have found themselves to be getting obsolete thanks to the wide array of options and access the internet provides. Some of these new and innovative services that have come to stay include wireless technology, internet television and radio/music streaming platforms, video streaming websites, email, digital newspapers, websites, and blogs. One of the many companies that have sprung up to capitalize on the technology available is the music streaming and internet radio service known as Pandora Radio. Pandora describes itself as the world’s most powerful music discovery platform because it runs an automated recommendation service that suggests and plays music of similar traits to the one the listener had previously chosen. The listener subsequently provides feedback by giving a thumbs up or thumbs down to signal how accurate the selection was. This feedback is then taken into account in subsequent music selection by the platform. Through this, Pandora gives artists a chance to find their fans but most importantly, cuts down the time in which listeners spend looking for what kind of music they want to listen to. What is today known as Pandora, officially Pandora Media Inc., was founded in 2000 by Will Glaser, Jon Kraft, and Tim Westergren as Savage Beast Technologies, an individualized radio station where users would only listen to music in which they preferred to hear. In its initial stages, the company went through funding challenges as it struggled to pay employees for a two year period before it was able to bounce back. In 2004, the company was able to bounce back as it changed its name to Pandora Media Inc. It ran for a while as a paid service to all its users before integrating to an advertising service to allow it to incorporate free users. In the years to come, Pandora Radio enjoyed huge success that led it to launch its IPO on the New York Stock Exchange in 2011 as it was now evaluated at nearly $2.6 billion. By 2013, the company had surpassed over 200 million users, of which 70 million were active every month. It was also at this time accounting for 70 percent of all internet radio listening in the United States. 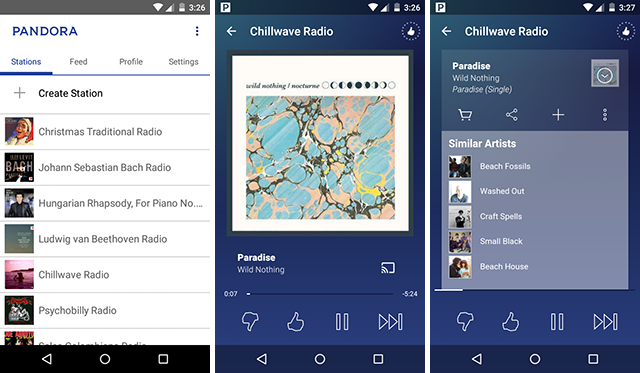 Pandora Radio allows its users to customize their individual radio stations by specifying an artist or song, or a combination of other things that interest them musically. More songs will then be subsequently added to the station based on similarities and thumbs up given to the songs already listened to. Users further have the option of listening to stations that were created by fellow listeners or other ones from established genres that were created by the streaming platform itself. Though music is indeed subjective, however, there are some tunes that will forever resonate with people regardless of preference. Here are a few of the best stations on Pandora Radio. 1. Stevie Wonder Radio: This radio plays a unique selection of mildly upbeat and soothing songs by Stevie Wonder and similar artists. 2. 90’s Alternative Radio: This station features music from rock, pop, and country musicians. It is good for a sing along with friends. 3. Chris Brown Radio: This station features songs from Chris Brown and other similar artists. It is best listened to when taking a road trip or just hanging out as a group. 4. Outkast Radio: This station is perfect for dancing thanks to its funky tunes and cool sound. 5. Disney Songs and Story Radio: This station might be best suitable and appealing to children, however, adults who are feeling nostalgic can also tune in to enjoy a good sing along. Before logging in, users will need to first set up their Pandora account. To do so, visit the Pandora website on www.pandora.com and click on the sign-up link located near the top right corner of the main page. You will be then required to complete all the fields of the registration form displayed. The fields include an email address, password, birth year, ZIP code, and gender will be used by the website to improve your listening experience. To log in on subsequent visits to the site, visit the webpage and enter your username and password. You can also log in with your Facebook or Twitter account. To do so, visit the Pandora website, click on the avatar on the upper right-hand corner to reveal the settings option and then click on it. The next step would be to click on “Connect” which is located under “Social” and then follow the prompts to sing with either of your social network profiles. Pandora Radio offers four separate categories of service to its users. 1. Ad-supported Pandora: This category, which supports ads as specified in its name, is free. 2. Pandora Plus: This category is an ad-free subscription service that costs $4.99 per month or $54.89 per year. For their money, users can create stations, replay tracks, listen to 3 of your most played offline stations, get higher quality audio, and a longer timeout period. 3. Pandora Premium: This category is also ad-free and costs $9.99 per month or $109.89 per year. Users of this subscription have the ability to search and play songs on-demand, no timeouts, fully customizable playlists, and more offline listening options. 4. Pandora Premium Family: This category offers all that is available with the Premium subscription but with six different accounts. It costs $14.99 per month or $164.89 per year. Pandora Radio users can choose to cancel their subscription at any time in order to stop future payments. However, note that a cancelation must be done at least 24 hours before your active subscription or trial expires and uninstalling the Pandora app does not cancel a subscription. To cancel, visit the store (iTunes, Google Play, Amazon Appstore, Roku, etc) from which the subscription was bought to complete the process as Pandora support does not manage subscriptions. 2. Tap the Apple ID button. 3. Select View Apple ID and follow prompts to log in. 4. Tap the Subscriptions button and select Pandora. 2. Find Pandora and then click Cancel Subscription then follow the prompts to confirm the cancellation.